Save Me and Killing Eve lead the nominations at this year's Royal Television Society (RTS) awards. Sky's Save me landed four nominations for drama, best male actor, drama writer and the breakthrough award. BBC drama Killing Eve gained three nods for best drama series and female actor - with Sandra Oh and Jodie Comer going head to head. But they will have to battle with Michaela Cole, who is recognised for Black Earth Rising. A Very English Scandal also received three nominations. The BBC One drama documented the rise and fall of politician Jeremy Thorpe. Russell T. Davies could take home the award for best writer, whilst the three-parter is also nominated in the mini series category, with Ben Whishaw up for best male actor for his portrayal of Norman Scott. 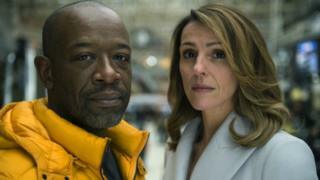 Whishaw's competition comes in the form of Lucian Msamati from Channel 4's Kiri and Lenny James from Save Me. Channel 5, BBC One and CBeebies go up against each other for 2019's RTS channel of the year award with Casualty, Hollyoaks and 2018 winner Coronation Street nominated in the soap category. Elsewhere, Lesley Manville is nominated in the comedy performance (female) category for her portrayal of Cathy in Mum, alongside Sian Gibson for Peter Kay's Car Share - The Finale and Daisy May Cooper in This Country. Cooper's BBC Three mockumentary scooped three prizes at last year's RTS Awards. Mum is also up for best comedy writer (Stefan Golaszewski). Derry Girls is also nominated in the categories of scripted comedy and writer (comedy) for Lisa McGee. David Attenborough, a winner in the 2018 awards, is again nominated for documentary series Blue Planet II.